Often described as gentle giants, English Mastiffs weigh in at around 220 pounds or more and stand between 28 and 36 inches tall. 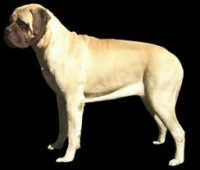 Though the English Mastiff temperament makes the breed extremely gentle and loving with family members, the massive size of these dogs makes them best for a more experienced dog owner. If you choose this breed, understand that you’ll need to start training and socializing your dog early so you can reliably direct 200-pounds of muscle with a single spoken command. Patient and nurturing, these sweet dogs are terrific with children and happy to take a friendly romp with other family pets if raised with them. Mastiffs form fierce bonds with their humans and, as a result, make wonderful companion animals. Though massive in size, this breed is a lover and will often attempt to climb into your lap for some snuggle time, utterly oblivious to the fact that he is far too big to be a lapdog. If you or your family encounter a threat, you can expect your Mastiff to defend you. Though unlikely to attack without extreme provocation, a Mastiff will make it clear that his family is off limits and will hold intruders at bay until help arrives. The English Mastiff temperament is one that takes well to training. Your puppy will want to please you and will do what he can to make you happy. Mastiffs are sensitive, however, and respond better to positive reinforcement than they do to scolding. While treats make good training rewards, your Mastiff may enjoy big hugs and heaps of praise more. The breed is very trainable, but these dogs need an owner who is consistent and firm. Strong leadership during training and beyond is a must given the massive size of the breed. You’re not likely to physically control or hold back such a large dog, so you must have the ability to do so using voice commands. As such, English Mastiffs are not recommended for first-time dog owners. Although Mastiffs fall hard and fast for their family members and friends, the breed is often very wary of strangers. This can lead to some undesirable behaviors if a dog is not socialized early and often. Make sure your puppy meets lots of people both inside and outside his own home. Mastiffs are very protective of their territory and family members, so make sure your dog understands that guests are not a threat. If you have children, make sure your puppy has ample opportunity to see them playing with each other and with other kids. Children’s playtime sometimes gets a bit physical, and you’ll want your dog to understand the difference between playful roughhousing and genuinely threatening behavior. Members of this breed absolutely adore their humans, making the English Mastiff temperament one that requires lots of family time. This is not a dog breed that can live outside in a doghouse or spend his days chained to a tree in the front yard. Although a Mastiff can tolerate being alone while you work and your children are in school, he’ll need lots of attention in the evening to keep him happy. There will be consequences if you leave your Mastiff alone for too long or allow him to get bored. Usually a lonely dog will resort to destructive chewing, but any number of unwanted behaviors can crop up in a bored dog. Do your best to never find out what it looks like when your dog acts out. If you’re looking for a faithful companion and all around great family dog, it’s hard to beat the English Mastiff temperament. As is true of all dogs, however, some individuals within the breed may display unique personality traits that don’t fit the expected mold. Always do your homework before adopting a breed so you have some idea what to expect, but commit yourself to making sure your dog gets the support and training he needs no matter what quirks he may possess.